Yellow fever is an acute infectious disease which flares up with dreadful epidemics. It mostly targets the liver and kidneys. Jaundice, fever, hemorrhages (mostly nose and gum bleedings), rarefaction or discontinuation of the urine output are the most characteristic symptoms of it. 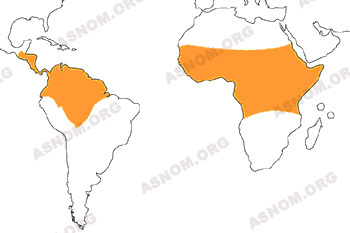 The amaril virus is the pathogen which is involved in Yellow fever and it is transmitted to man through a mosquito bite. In fact this is a disease that affects monkeys which live in forests and in the wilderness of Sub Saharan Africa and of tropical America, these are the only places where this disease is rife. No specific therapy is so far available and whenever a patient survives, he is permanently immune to the disease and this explains why vaccination is such an efficacious one. Medical officers of the Colonial Medical Corps were confronted to yellow fever and had to endure its scary epidemics. With the help of their native co-workers they intervened in the field of action and also in the Overseas Pasteur Institutes laboratories and especially in Dakar. - These practical experienced men identified the disease, detected it, provided care to those who were sick and helped to prevent it. - They took a part in shedding light on the role of mosquitoes and in the isolation of the amaril virus. - They improved the way of diagnosing the disease in their labs. - They developed an efficacious vaccine and made all necessary arrangements for its production. - They kept watching out for the amaril risk in Sub Saharan Africa and in Tropical America. Scary flare ups of yellow fever occurred with the death of half of the ones who had been sickened until the turn of the twentieth century. It was graded a pestilential disease and later a quarantinable one. There are however many "flu like" or milder cases with a much lower fatality rate as it is in the 10% range. In 1648 the Spaniards in Yucatan were the first to report the disease. They named it "plague" but this must be considered as an archaic term which at that point of time was given to many different medical conditions. As they scoured Tropical America, the Caribbean and also Sub Saharan Africa the French happened to come across this scourge. In 1778 in St Louis, Senegal which is a city located at the mouth of the Senegal river, J.P. Schotte gave it the scholarly but short lived designation of "Synochus Atrabilosa". In 1763 already, colonization of French Guiana had been confronted with Yellow Fever which was then named "amaril typhus". Survivors fled to the Devil Islands, which are located in the open sea, east of Kourou and afterwards, these islands became known as the Refuge Islands ("Iles du Salut"). - In 1802 Napoleon assigned his brother in law General E. Leclerc with his thirty thousand men to Dominica to quell Toussaint-Louverture's uprising. Only a small number of them were able to make it back home as they were the only survivors of an outbreak of yellow fever which had claimed Leclerc's life. 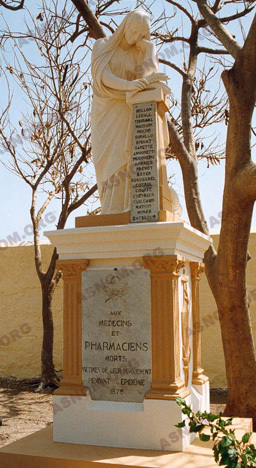 - The 1878 outbreak in Senegal among others claimed the life of 21 physicians and pharmacists. There was only one who survived. Two steles, the first one in St Louis, Senegal, the other one in the island of Gorée which is in the open sea, west of Dakar, are there to show the respects which are paid to physicians who fulfilled their duties among populations and at the bedside of patients to such an extent that they finally wound up as victims of the disease. - In 1889 the Panama Canal digging had to be given up by the French because of Yellow Fever. The forerunners of colonial physicians reported the symptoms of the disease and identified it in the maze of many other tropical fevers. In infirmaries, mobile field hospitals and lazarets, Navy medical officers showed the kind of painstaking and skilled clinicians they were. Their reports are still today high valued ones. - The red one when the patient is running a fever, is restless and crippled by pain. His face and eyes are flushed and red. - The second one dubbed the yellow or the icteric one, gave its name to the disease (amarillo means yellow in Spanish). It starts on the fifth day. The patient's eyes turn yellow, he throws up blackened blood dubbed "black vomit", his urine becomes scarce or even absent because of renal failure and the ensuing death occurs sometime between the 4th and 11th day after the onset. This disease was a cause of concern for all physicians who were on assignment in Sub Saharan Africa but especially those posted in rural areas as they had to treat or to prevent it. It did not happen to all of them to have to live amid an epidemic focus but through their presence and vigilance they were sentinels who kept watching out for epidemics. In his lonely medical facility a young physician who was posted in the outback ("bush doctor") carried out the examination of patients, especially those who were running a fever and made authorities aware of any unusual number of fatalities in a village. In so doing he was providing an epidemiological watch. As soon as the Dakar Pasteur Institute vaccine became available, then this physician became in charge of carrying out the combined immunization program of the district's whole population with both yellow fever and smallpox vaccines which had been mixed together before their inoculation. Later on, the Major Endemic Diseases Department took over the implementation of these programs of vaccination. Finally the Public Hygiene Department which was concerned by malaria as well as by yellow fever had to look after the sanitation of villages by the destruction of mosquitoes and through seeking out the places where they had laid their eggs such as stagnant water pools and home water tanks. Should we remind our browsers that any loosening in these vaccination programs or of the sanitation enforcement made the region at risk of going through a new outbreak ? In 1884, Carlos Finlay in Cuba suspected the role which mosquitoes could have in the transmission of the disease to humans. It should also be noted that thirty years earlier in 1854 a French and Venezuelan physician named Louis Daniel Beaupertuy (1807-1871) in Venezuela had already claimed that yellow fever was mosquito borne and therefore he had recommended the use of a mosquito net at night. He was the grandson of "an apothecary" and the son of "a medical officer" of the French Royal Navy who both had been on assignment at the military hospital in the Guadeloupe Island. The Academy of Sciences in Paris did not attach any value to Beauperthuy's works which he published, among some other journals, in the academy's own magazine but finally his claim went unnoticed. In 1901 a US mission which was headed by Walter Reed confirmed Finlay's assumption and designated a mosquito belonging to the Aedes genus as the transmitting agent. Around the same time France had commissioned P.L. Simond* and E. Marchoux* to go on assignment to Brazil for a four year long scientific mission. They also confirmed the role of this mosquito and beside their research work, these Colonial Army medical officers took an active part in the fight against an epidemic which was then in full swing in Rio de Janeiro. Marchoux was awarded the distinction of "Honorary Citizen" of the town. As far as the isolation of the virus is concerned it took place simultaneously in 1927 with a British scientist named A.Stokes in Ghana and with C.Mathis* and J.Laigret* who were two French researchers of the Dakar Pasteur Institute. Informing the international community of any case of yellow fever is an obligation so that one has to be fully aware of both the importance and the severity of this diagnosis. It is based on laboratory tests with mostly the examination of a liver sample by a pathologist after it has been taken from the corpse of an individual deceased with suspected yellow fever. This sample has to be shipped from the place in the outback where it was taken to the main city. 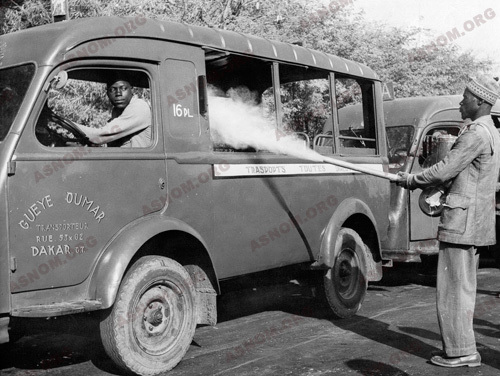 During the 1965 Senegalese epidemic, R. Camain* at Dakar Pasteur Institute had the opportunity of updating the data regarding the hepatic lesions which are specific to yellow fever and in particular those which are found at the initial stage of the disease. The second way we have to be absolutely certain of the accuracy of the diagnosis is with the isolation of the virus from a blood sample or from tissue samples which have been taken during the autopsy. This has to be done in a laboratory which is supplied with the adequate equipment. There is now a serology test which provides a result within a few hours but virus isolation remains the only internationally accepted standard for claiming that there is somewhere a yellow fever focus. In the Dakar and Abidjan Pasteur Institutes, Lhuillier* developed a test for a quick identification of IgM antibodies in a blood sample taken from a patient who is suspected with yellow fever. Within one hour or so the diagnosis is confirmed or at least deemed very likely or it can be ruled out. This can help to sketch the frontline of an outbreak and to concentrate prevention and vaccination efforts in places which are endangered. 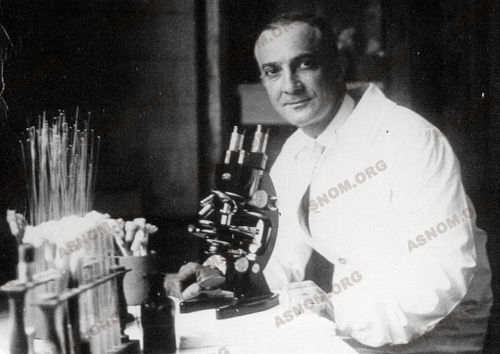 An American scientist named Max Theiler succeeded in adapting to mice the viral strain which Mathis* and Laigret* had isolated in Dakar in 1927. The development of the first vaccine took place subsequently with the cooperation of Laigret* and of another American scientist by the name of A.W.Sellards. In 1939, M. Peltier* C. Durieux*, H. Jonchére* and E. Arquié* developed a more efficacious one which was better tolerated and it became known as the "Dakar Pasteur Institute Vaccine". 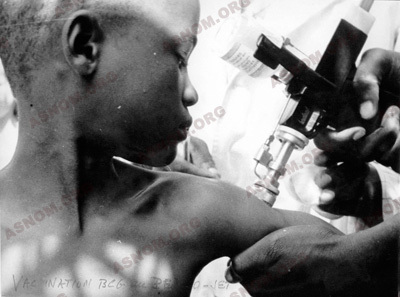 Its administration through a skin scarification was easy and it could be associated with the smallpox vaccine. 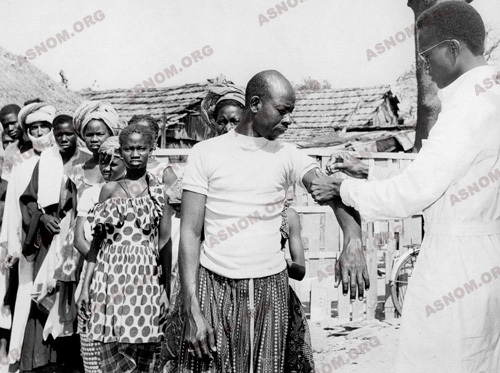 During the nineteen forties with the implementation of programs of immunization among the whole populations in the African colonies, yellow fever vanished. Unfortunately the use of this vaccine was accountable for severe and even lethal cases of meningo-encephalitis. Its use was at first limited to individuals who were over twelve years of age and later in 1967 it had to be abandoned. It was replaced by one which is still used today which is the "Rockefeller 17D vaccine". It was also developed by Max Theiler and is still considered as a perfectly valid one. It is delivered to individuals who are over the age of one through a subcutaneous injection. Its tolerance is excellent and it induces a long-lasting immunity which lasts at least ten years. As its inactivation by heat is a drawback, now it has become standard practice to supplement it when it is manufactured at the Pasteur Institute in Dakar with an excipient which was developed at the Paris Pasteur Institute (Barme) which supplies an excellent thermo-stability. With its own production the Pasteur Institute in Dakar is now able to provide all facilities in French speaking countries of Africa with all the vaccine they need and in so doing brings its contribution to the protection of this continent. Immunization with the same vaccine dubbed the amaril vaccine is now required by international regulations for those who travel to Sub Saharan Africa or to Tropical America. Infected monkey ---> Mosquito ---> Healthy monkey. This "jungle yellow fever" cannot be eradicated and humans are intruders in this cycle. After a non immunized individual is bitten by a mosquito carrying the virus on the occasion of a trip to the wilderness, or with the intrusion of an infected monkey in a village where it gets bitten by a mosquito, then the first human cases occur and mosquitoes will spread the disease. Vaccination provides a protection which lasts over ten year. After a vaccination campaign, populations are no longer receptive to the disease and are fully safe, so that epidemics become rare and whenever one occurs it is going to be short-lived. There are still some flare ups which persist as according to the data compiled by the WHO, each year there are two hundred thousand non vaccinated individuals who catch the disease with thirty thousand fatalities. All measures to be taken for Yellow Fever control have been codified in a text which is known as "the International Sanitary Regulations" which has been passed by the international community. Protection of the world implies that specialized facilities which are located in affected areas keep watching out. For many years now, the Dakar Pasteur Institute has been one of the four "WHO Regional Reference Centres" which are in charge of keeping the disease under control. Today the monitoring system which was started by the time of colonization is still in operation. Teams of Scientists of the Pasteur Institute and of the French Institute for Overseas Scientific Research are in charge of monitoring the virus circulation among humans and monkeys with serial serum testing and also with catching carrying vectors with traps and human baits. 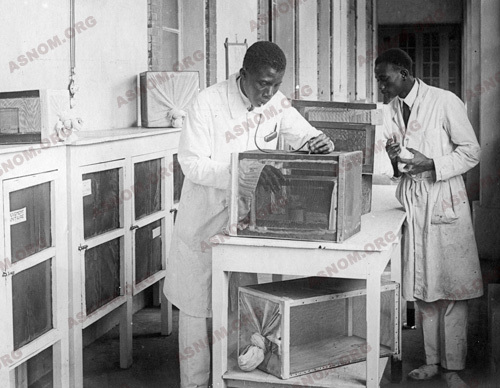 In 1965 Pasteur Institute scientists who were members of the Colonial Medical Corps have set up procedures and practical programs of action. Across Africa many colonial biologists took an active part in the programs to fight the disease. The vaccine which is in use now, is efficacious against all strains of the amaril virus. Research has nevertheless to be carried on in order to sequence the virus as accurately as possible and to develop new vaccines. The Tropical Medicine Institute of the Armed Forces with the Institute of Molecular Biology at the Pharo in Marseilles take an important part in this high tech research program (Nicoli* and Coll*). On the grounds of his fame, a colonial Pasteur Institute alumnus by the name of P. Bres*, was assigned to the head the Arbovirus and Yellow Fever Department of WHO, in Geneva, which he ran from 1970 to 1981. 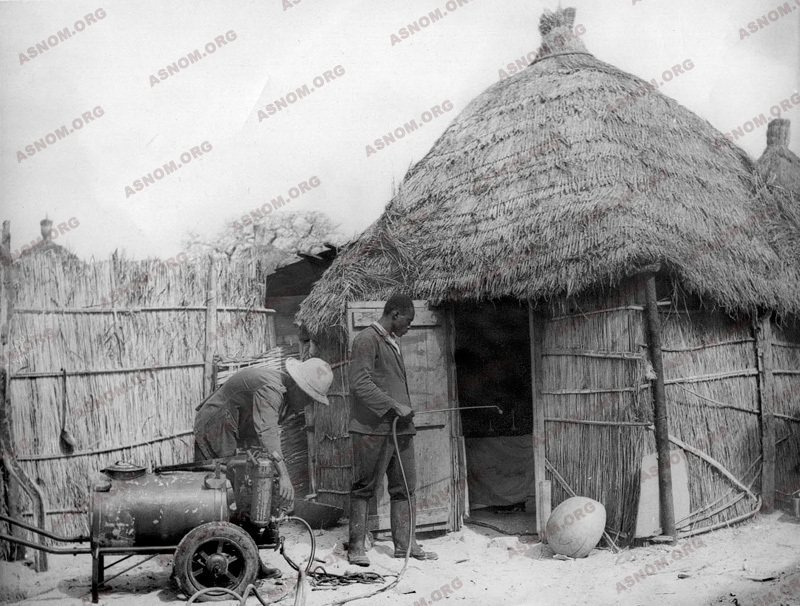 The achievements of the Colonial Medical Corps were largely successful as within its range of influence there has been no flare up similar to the ones of the nineteenth century. As long as the same kind of coverage of populations which was provided by the Corps is carried on, reports of large epidemics of Yellow Fever will be found only in history textbooks. But since 1965 there is a lack of regularity in the implementation of the vaccination campaigns, small epidemics can occur now. There are an estimated two hundred thousand cases a year with around thirty thousand fatalities.